Kareo Clinical is a user-friendly and assimilated electronic health record (EHR) keeper. With the software, medical workers can input notes and prescriptions with ease. They are also able to take note of encounters and manage incoming and outgoing patients at the same time. All these and more are provided by this cloud-based solution. Kareo Clinical is indeed something that is designed for doctors as the solution was collaborated upon by like-minded individuals from the medical profession. It is a powerful feature-rich module but at the same time, it also gives precedence to the user’s ease of use. With Kareo Clinical, everything a physician or medical staff needs is within reach. The cloud-based technology is accessible from any device and does not require installation nor special hardware. And with that, health institutions can get started right away with their EHR. Kareo’s Live Compliance program covers all areas needed to becoming and remaining HIPAA compliant. Kareo Clinical provides physicians and non-physicians a comprehensive dashboard that shows important agendas at a glance. Here, they can view a list of tasks embedded in their customizable calendar. This way, they can see what they need to do in one screen, allowing them to immediately take action on outstanding matters. With Kareo Clinical, health staff are able to make notes regarding their patient encounters with ease. It includes all relevant patient information such as their prescribed medications and previous surgical operations. The solution enables health workers to immediately find the information they need and input additional data with ease, saving them time of having to search for patient profiles and effacing paper stockpiles. E-prescribing saves valuable resources for both the health care institution and the patient. The feature assists physicians in finding the most affordable medications and offer them coupons right from the Kareo Clinical interface. This enables patients follow the physician’s prescription orders while saving money at the same time. Kareo Clinical provides an efficient work platform for healthcare workers. Because the solution is cloud-based, health staff can take it anywhere with them while they make their rounds and consult with patients. Any note they have to take they can record immediately in the application, thus effacing disorganized paper processes. With this module, hospital and clinical staff can populate superbills with ease. Once a patient’s assessment is keyed into the chart, Kareo Clinical automatically reflects this in the superbill. On the other hand, staff can choose to manually choose the diagnosis or code for the visit. The solution then takes stock of the most used items and stores them in a favorites view where users can immediately choose the correct entry quickly. Not only does this save them time, it also prevents them from exerting more effort with the automated processes. Kareo Clinical offers a secure way for physicians and other health workers to communicate with each other. This ensures that sensitive practice and patient information remain within the confines of the application. In addition, the interface also offers a way for doctors to send messages to their patients at any time. This increases their productivity and provides them with the peace of mind that all communications remain confident. If you are considering Kareo Clinical it may also be sensible to check out other subcategories of Best EHR Software listed in our database of B2B software reviews. It is important to keep in mind that hardly any service in the EHR Software category will be a perfect solution able to match all the goals of different company types, sizes and industries. It may be a good idea to read a few Kareo Clinical reviews first as specific solutions might perform well only in a really narrow set of applications or be created with a very specific type of industry in mind. Others might function with an intention of being simple and intuitive and consequently lack advanced elements needed by more experienced users. There are also solutions that cater to a broad group of customers and provide a powerful feature toolbox, however this frequently comes at a higher cost of such a solution. Ensure you're aware of your needs so that you choose a service that provides specifically the features you look for. How Much Does Kareo Clinical Cost? We realize that when you make a decision to buy EHR Software it’s important not only to see how experts evaluate it in their reviews, but also to find out if the real people and companies that buy it are actually satisfied with the product. That’s why we’ve created our behavior-based Customer Satisfaction Algorithm™ that gathers customer reviews, comments and Kareo Clinical reviews across a wide range of social media sites. The data is then presented in an easy to digest form showing how many people had positive and negative experience with Kareo Clinical. With that information at hand you should be equipped to make an informed buying decision that you won’t regret. What are Kareo Clinical pricing details? 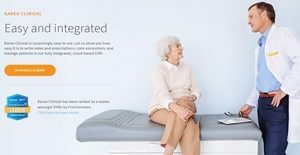 What integrations are available for Kareo Clinical? Kareo Clinical has an open API that health services providers can use to integrate with other systems such as electronic medical records and accounting solutions. Examples are Practice Fusion EHR, WebPT EHR, and QuickBooks. If you need more information about Kareo Clinical or you simply have a question let us know what you need and we’ll forward your request directly to the vendor.